Luis Suarez scored the only goal against QPR as a dominant Liverpool avoided a fifth successive home draw and climbed to sixth in the table. 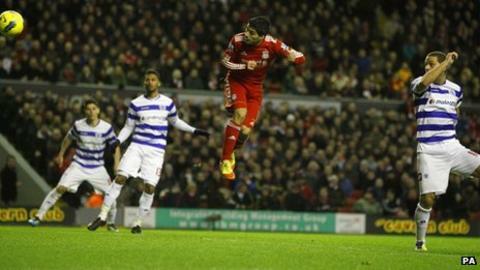 QPR kept the hosts out until 69 seconds into the second half when an unmarked Suarez headed in Charlie Adam's cross. It was Suarez's first league goal since netting against Everton on 1 October - and comes in the week he was charged by the Football Association for a hand gesture made towards Fulham fans. Radek Cerny made several superb saves. But his team rarely threatened, except from corners, and almost conceded an own goal when Shaun Wright-Phillips hit the bar late on. Uruguayan Suarez, 24, had scored five goals for his country since his last Premier League strike. But he has consistently been in the headlines as he faces a second FA charge . If the win kept Liverpool on the fringes of the race for the Champions League places, it also left nagging doubts about their stuttering home form, which has seen them draw with both title-chasing Manchester clubs but also Sunderland and the two sides promoted with QPR - Norwich and Swansea. The game, and particularly the opening 45 minutes, gave a taster of why Kenny Dalglish's side have drawn so often this season and failed to secure more points at Anfield. Liverpool dominated possession, won 10 corners, and created a reasonable number of chances - but rarely forced Cerny into serious action. Maxi Rodriguez was the man most frequently denied by the Czech keeper but, in truth, he should have scored after he was sent clear by Dirk Kuyt's perceptive pass Cerny got down quickly to make a one-handed save from the Argentine's shot. Just before the interval, Cerny's decision to stand up until the last possible moment proved the right one as Suarez tried to chip the ball into the net from an acute angle and the keeper palmed the ball away. In first-half stoppage time he then moved quickly to his left to gather a Stewart Downing shot as QPR saw out the first phase of their containment operation at Anfield. Suarez had frequently glimpsed goal in the first half but was unable to capitalise on his prodigious work-rate and unerring ability to find space. He sent a free header straight at Cerny early on, miscued after being teed up by Maxi, and ended the half allowing the ball to flash past him, possibly due to a misunderstanding with Daniel Agger, who was in close proximity. However all QPR's good work went to waste in the second minute after the restart when Suarez was left unmarked and the Uruguayan guided his header into the corner of the net from the edge of the six-yard box. QPR then lost Anton Ferdinand through injury but the visitors - Cerny in particular - continued to frustrate Liverpool. The Rangers keeper threw himself to his left to tip Maxi's shot on to the post and then bravely denied the same player after the Argentine completed a one-two with Suarez. With the clock running down, QPR forced a flurry of corners, one of which Reina was forced to clear from almost under his bar. Liverpool might have had a second goal in stoppage time when Wright-Phillips almost scored an own goal as his defensive clearance from a Craig Bellamy centre hit the underside of the Rangers bar. Liverpool manager Kenny Dalglish: "It was an excellent performance. We had a lot of chances and we got one (goal), they never got any. "One is enough when the others don't get an opportunity and the players showed great courage and belief in what they are doing to continue doing what they were doing well which was pass and move and creating chances. "Some of the football we played in the first half was brilliant and I think we played better before we scored than after it - but even then we still created a few." QPR boss Neil Warnock: "We were superb. Luis Suarez was magnificent and it was appropriate the best player on the pitch scored - we lost him, but that is what good players do. "We never really tested Pepe Reina but I couldn't fault anyone, and to have them biting their nails in the last 10 minutes was testament to the team. "[Keeper] Radek Cerny is a top professional. He didn't deserve to be on the losing side."